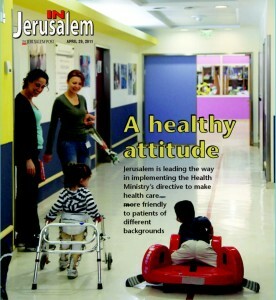 The cover relates to the main article in the magazine that depicts the work of the JICC in the area of cultural competence in Jerusalem health system and beyond. It shows how our pioneer work creates a ripple effect - impacting the national health system and other systems as well. Efforts are being made to enable patients of all backgrounds to communicate with their doctors, but a culture gap remains. Suppose you felt very sick, but when you reached an Israeli hospital, the doctors and nurses spoke only Swahili. You couldn’t describe your problem, ask or answer questions, understand the forms you had to sign or even identify the WC. Like the Bantu language of eastern Africa, Hebrew is spoken by only five to 10 million natives. But even though no US hospital or clinic is eligible for federal funds unless it has a team of professional medical translators and experts in cultural competency, the Health Ministry has not set any requirements that will help masses of immigrants and Israeli Arabs communicate in health facilities. And Israel has an even higher proportion of immigrants speaking languages other than the native tongue than the US. Imagine visiting a foreign country, where you do not speak the language, and needing medical attention. Unable to understand the doctor’s instructions, warning labels on medication or paperwork needed to be filled out, it would be a grave situation. But as bad as that is, imagine if this was in your own country, where you lived. What seems like a nightmare is, for many of the country’s residents, a reality. In Jerusalem alone, with its diverse population, you can ride a bus and easily hear five different languages being spoken. Despite this, the healthcare system speaks only one. So what are the non-Hebrew speakers to do? Until now, basically nothing. While the idea of cultural competence is gaining popularity throughout Western countries, Israel is somewhat behind. In some countries, there are laws regulating the languages in which certain services must be provided in an effort to be more competent in dealing with different cultures. With the most pressing area arguably the healthcare system, little has been done in Israel to accommodate the needs of patients from different backgrounds who speak a number of different languages. But not everyone has been standing idly by. Recognizing the diverse nature of the city , the Jerusalem Inter-Cultural Center (JICC) has been active for more than 10 years, trying to make the capital a more residentfriendly city, no matter what the resident’s religious beliefs, ethnicity or language. Among its efforts, the JICC has been instrumental in bridging haredi and non-haredi elements in the city, has acted to improve the municipality’s service to east Jerusalem and has tried to increase cooperation between Arab and Jewish groups by involving them in joint projects. Four years ago, the JICC began promoting the idea of cultural competence in the healthcare system in Jerusalem in an effort to enable patients of all backgrounds to have the ability to communicate with their healthcare providers and understand their medical treatment. But there is a solution - medical interpreters. “There can be an interpreter in the room with the patient or telephonic interpretation. [The doctor has] a phone with two receivers, and he calls someone somewhere in the world [who can speak that language],” explains Agmon-Snir. Each option has its advantages and disadvantages. The live, present interpreter may be better qualified, but his presence may make some patients uncomfortable and less willing to disclose information. The telephonic option is more discreet and offers translations in 180 languages, though it’s not medical-specific. But according to Agmon-Snir, there are almost no hospitals in the country that employ interpreters or offer the telephone service. Instead, most hospitals, when faced with a non-Hebrew speaking patient, rely on makeshift sign language, a non-native common language like English or a fellow patient or family member to interpret. “But these solutions are very problematic, ethically as well,” says Agmon-Snir. “To get a patient and have him translate someone else’s personal problems or having children translate problems relating to their mother’s pregnancy or menstruation is a very problematic thing,” he says. In February, however, the Health Ministry made what has been hailed by many as a breakthrough. It issued a directive calling for an increase of cultural competence throughout the country’s healthcare providers. Among the directive’s requirements are the following: all forms requiring a patient’s signature must appear in Hebrew, Arabic, English and Russian; signs must be posted in Hebrew, English and Arabic; call centers must offer service in Hebrew, English, Arabic, Russian and Amharic; and some form of interpretation service must be offered to any patient who requests it, be it by an employed interpreter, a staff member who is bilingual or a telephone service. The directive applies to hospitals, as well as health fund clinics and public health facilities. Every healthcare provider has two years to implement the directive. Though groups such as the inter-cultural center praised the directive as an advancement in cultural competence awareness, many people were up in arms because while the directive calls for the implementation of costly translation services, it does not provide any financial support. Moreover, there are those who feel that Arabs and other minorities should learn Hebrew and that new immigrants should learn to speak the language just like everyone else. But according to Agmon-Snir, that ideology has no place in the healthcare system. “If I’m a new immigrant, who says I can learn a new language well enough to understand everything that they tell me? And in healthcare, that’s critical,” he says. “Every person has a mother tongue in which he understands the best. If you’re a nurse or a doctor or a pharmacist, you have to provide the best possible service; this isn’t the education system,” he charges. He adds that many aspects of the directive are already anchored in the National Health Insurance Law of 1994, making the directive legally binding, whether critics approve of it or not. But cultural competence goes far beyond translation. “The more a patient feels his needs are being met, spiritually as well, the more able he is to be healed,” says Agmon-Snir. He says that many people connect to God while in the hospital. “The moment you see that there is a place for you to pray or for your family to pray, and you see that the hospital takes you and your needs seriously, then your attitude towards the medical staff and to treatment is different… it helps you heal,” he says. Understanding a patient’s religious needs is also an important part of healthcare. To that end, the Alyn Pediatric and Adolescent Rehabilitation Center, which caters to a large non-Hebrew-speaking clientele and underwent a number of JICC cultural competence seminars two years ago, opened a Muslim prayer room. “Abroad, it’s very acceptable - Coney Island hospital in New York has a mosque, a synagogue, a church and a Hindu temple. But here in Israel, to build a Muslim prayer room is seen as a political statement,” says Agmon-Snir, who stresses that it’s really a professional statement, not a political one. According to Naomi Geffen, cultural competence coordinator at Alyn, the hospital had a synagogue at the current location since 1971 but only recently installed a Muslim place of worship. “In 2010 we opened a prayer room for Muslims, along with the JICC and an imam to help us set it up. His congregation donated a special clock and rugs,” says Geffen. She says the hospital has received a lot of positive feedback about it. To date, Alyn has undergone the most extensive process and, according to Agmon-Snir, it’s the most culturally competent hospital in Israel. The JICC training, which Alyn underwent, is mainly funded by the Jerusalem Foundation. It provides seminars on how to treat patients from different cultures, offers special medical interpretation courses and helps institutions become more culturally friendly to their patients. But the participating institutions also invest their own money to send the staff to the seminars, hire interpreters, and build facilities such as the Muslim prayer room. “We wanted to expose workers to different scenarios and give them the ability to be more sensitive to people from all different backgrounds,” says Geffen. “We brought in actors to perform scenarios and see how we should relate to different cultures.” The hospital sent 14 employees to become trained medical interpreters, and all signs were changed to read in Hebrew, Arabic and English, with some departments bearing signs in Russian as well. “There’s always space to learn, and we wanted to become more aware and sensitive at foreseeing problems that could happen and set up therapeutic settings that would prevent them,” says Geffen. After undergoing a two-year in-depth process, the hospital now conducts regular follow-ups every three months, which involve films, discussions and lectures. According to Geffen, 99 percent of the Health Ministry’s directive has already been implemented at Alyn. Hadassah Medical Center on Mount Scopus is following suit. In September it began training Arab and Russian-speaking volunteers to become medical interpreters. At the same time, the hospital worked to educate the rest of the staff about the uses and capabilities of these interpreters. To date, there are 34 volunteer interpreters who are available for daytime rotations. The interpreters serve in the gynecology, emergency and internal medicine departments, where they are most needed, but can be requested by telephone to help out in any area of the hospital. In November, the first month the interpreters were made available at Hadassah, there were 83 requests for their services. By January the number had risen to 121. Adit Dayan of The Jerusalem Foundation, a major partner in funding the JICC project, says the training provided for Hadassah cost NIS 180,000, aside from the hospital’s own costs of sending employees to the seminars. Dayan says that with the release of the new directive, many more hospitals and clinics have been approaching the foundation requesting their assistance, and she hopes the foundation can work out an arrangement to aid them. But beyond interpreters and religious needs, there are additional aspects of cultural competence. One example is understanding the patient’s expectations of proper treatment. “The average Ethiopian, for instance, expects the doctor to touch him when treating him; but the average Israeli doctor just takes his card, looks at the lab results and barely even looks at the patient,” says Agmon-Snir. “From the Ethiopian’s perspective, that’s a bad doctor. They feel that blood should be drawn, or at least blood pressure should be taken,” he says. According to him, doctors should go out of their way to perform minor procedures like taking blood pressure, even if it’s unnecessary, if it gives a patient the sense that he’s receiving proper care. Another dimension of cultural competence dealt with in the JICC seminars is manner of speech. “Israelis speak the most direct language. In addition, medical jargon in Israel is very direct,” says Agmon-Snir. “So when a patient [from a different culture] walks in and speaks with the doctor, there are two problems: the directness of the doctor’s speech may be insulting, and the Israeli ear is not sensitive to what it hears,” he says. “Instead of asking a patient if he understood, the doctor should ask him what he understood.” Only in this way can the doctor verify that the patient fully comprehends what he is being told. Cultural competence, however, is not just for minorities. According to Agmon-Snir, we all potentially have what to gain from a more culture-conscious environment. “In today’s Israeli reality, everyone is a minority. Many times, even the hegemony feels like a minority,” he says. “When you go to the hospital and you’re sick and the doctors come and speak Russian around you, the fact that you’re a native Israeli doesn’t help,” he says. He adds that many doctors and nurses today are Arabs. With the new Health Ministry directive, the JICC is receiving an increasing number of requests to help make facilities, in Jerusalem and beyond, more culturally competent. Agmon-Snir’s hope, however, is that this is just the beginning and that awareness of the need for cultural competence will grow and extend to other realms as well, such as legal and social services. This entry was posted on Friday, April 29th, 2011 at 2:00 pm	and is filed under Cultural Competence, Cultural Competence in Health Services. You can follow any responses to this entry through the RSS 2.0 feed. Both comments and pings are currently closed.